Now, in charming cobblestoned old-town Alghero, the exterior of Pasta & Co. raised some red flags for me. Sterile much? 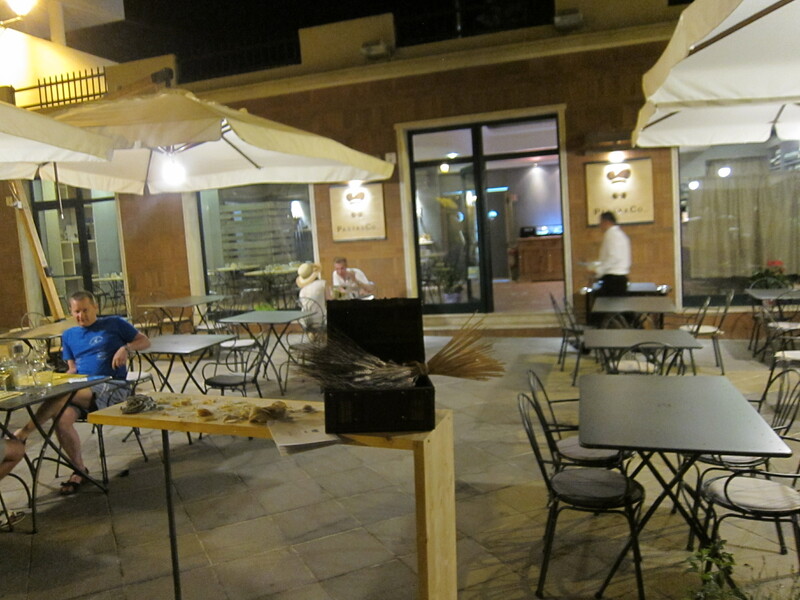 Once we were at our tavolo however, our friendly and attentive waiter set us at ease right away. 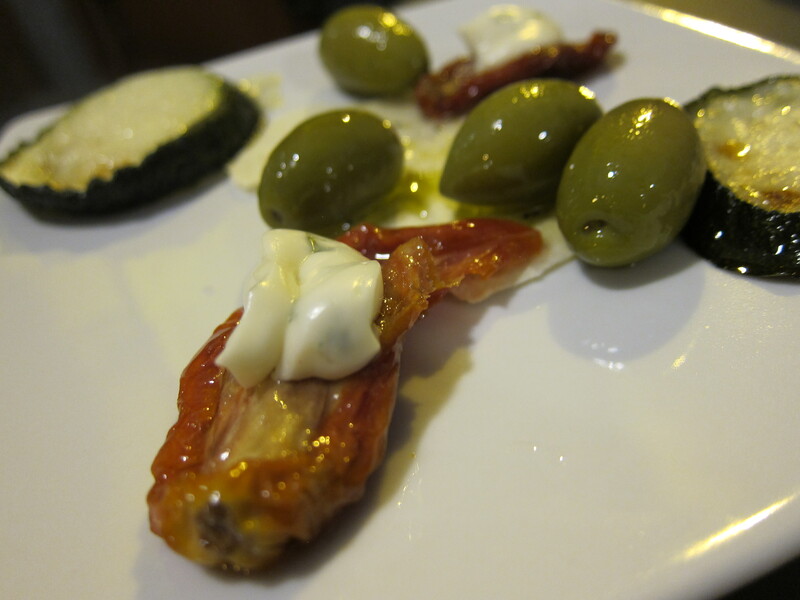 First up, there was the complimentary plate of little antipasti nibbles: olives and sundried tomatoes and sauteed zucchini drizzled with olive oil — all very tasty. If you’ve never been to Sardinia, this is a treat: pane carasau, a very thin and crispy flatbread (you can see it beneath the olives) that’s served with olive oil drizzled over it. It’s an ancient bread, apparently created for shepherds as it can be kept for up to a year if kept dry. The thing about learning Italian in Italy is that the language comes alive around you in all sorts of ways every day. Just that morning, our conversational Italian teacher Alessandra had told us about fregola, a Sardinian pasta that looks like little kernels of corn — and that night, there it was on the menu! So of course we had to order it. 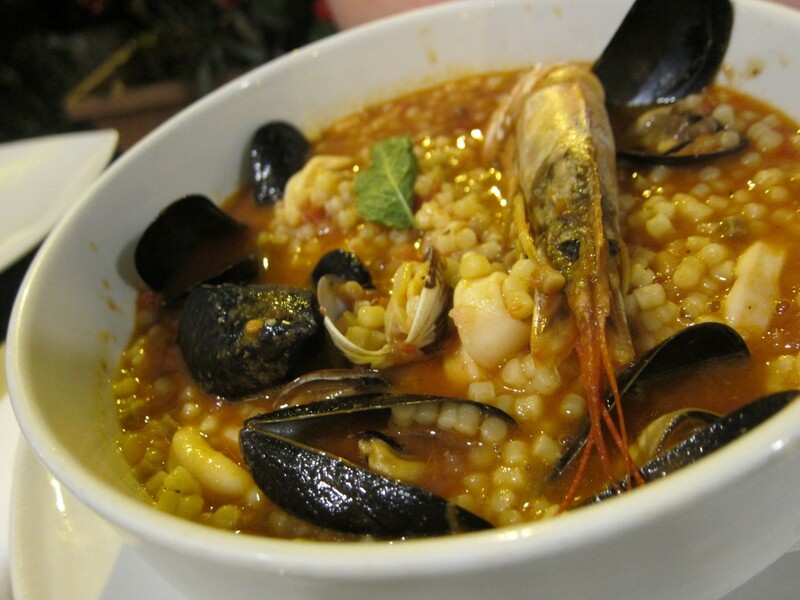 When Caroline’s bowl of fregola in guazzetto di mare (seafood stew) hit our table, I was shocked at its size. The 12€ dish was massive and just packed with fregola, mussels, clams, squid, cuttlefish and a large prawn. The fregola was, well, just about as it looks but the stew was terrific — filled to the gills with the briny flavors of the sea. As tempted as I’d been to try the fregola myself, another dish caught my eye: Spaghetti All’Algherese (12€), which is pasta with cherry tomatoes, olives, capers, clams and pepper. Something shifted recently however. D.B. happens to be a massive lover of olives and evening after evening of watching him gnaw at them with great delight, something clicked. I picked one up, popped it in my mouth and everything became clear. I loved how briny, green and juicy it was. And as soon as I was done, I could not wait to eat another. Naturally, when I saw this olive pasta (pictured up top) on the menu, I had to try it — and it was delicious. How can you go wrong with the combination of capers, clams and olives, however. 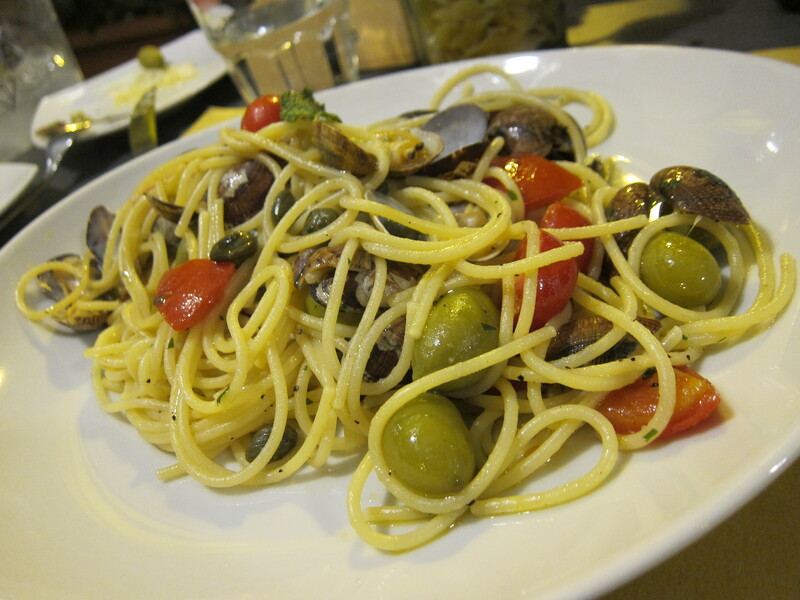 With that mix, each strand of pasta tasted of olives and the sea. So, there you have it. It is possible for a kitschy restaurant with a name like Pasta & Co. to have actual food chops. That saying about not judging a book by its cover? I sure was glad we didn’t.